Dubai: Nothing can console the family of a Sharjah man who passed away on July 15, 2017 but knowing he saved five lives across two countries may help them feel he did not die in vain. Nearly 20 months after the incident, Mohammad Bin Rashid University of Medicine and Health Sciences (MBRU) at Dubai Healthcare City has unveiled a heart-warming video showing how the kidneys, lungs, liver and pancreas of the deceased were dashed to patients at various locations as part of a well-coordinated multi-organ donation and transplant procedure. The pancreas, lungs and liver were flown to Riyadh in Saudi Arabia where they saved three lives while the kidneys were rushed to Dubai and Abu Dhabi via ambulance and helicopter to save another two. The video — the first of two — was released on the sidelines of the Arab Health Exhibition and Conference 2019 in conjunction with the launch of an online platform called Hayat that allows individuals to register as organ donors. The second multi-organ donor donation and transplant was carried out in the UAE on September 23, 2017, where four successful transplants saved as many lives. MBRU said the videos highlight the first steps taken in the launch of the national programme for organ transplantation under the leadership of the Ministry of Health and Prevention with the participation of national health authorities and government and private entities with the collaboration of the Saudi Centre for Organ Transplantation. The launch of the videos aims to recognise the teamwork of the people who played a key role in saving the lives of five patients suffering from organ failure. The multi-organ transplants were made possible with the efforts of various organisations. 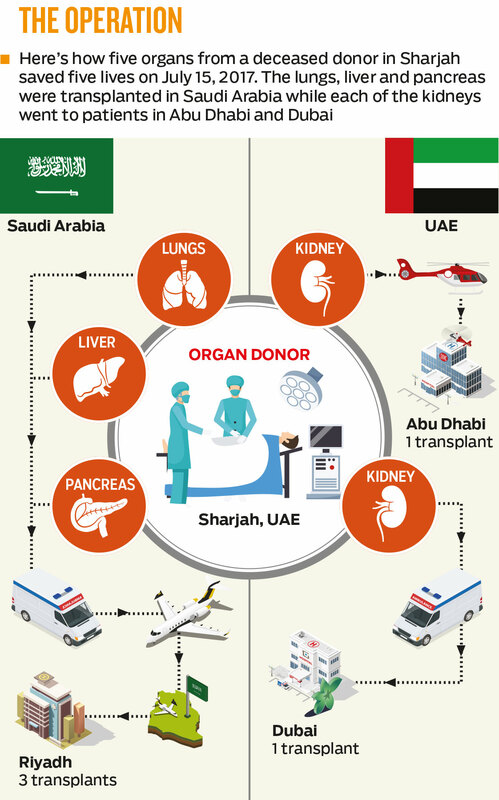 They include Ministry of Health and Prevention, the Saudi Centre for Organ Transplantation; Dubai Healthcare City Authority; Abu Dhabi Health Services Company; UAE’s Ministry of Interior; Dubai Airports; Fujairah International Airport; Mohammad Bin Rashid University of Medicine and Health Sciences; Shaikh Khalifa Medical City; Mediclinic City Hospital; Cleveland Clinic Abu Dhabi and Dubai Corporation for Ambulance Services, Dubai Customs; General Directorate of Residency and Foreigners Affairs in Dubai; Dubai Police; Abu Dhabi Police and Sharjah Police General Directorate. Mohammad Bin Rashid University of Medicine and Health Sciences (MBRU) is the first educational institution in the UAE to run an organ transplantation programme, in particular for kidneys. The programme was launched in June 2016, in tandem with the first successful kidney transplant for an Emirati patient, a 29-year-old mother of two. The procedure was conducted by a joint medical team from MBRU and Mediclinic City Hospital.